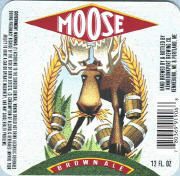 Cool looking moose-with-barrel graphics on label may be only distinctive character of this simple ale. Light chocolate souring and muted hop bitterness soften palate to lightweight mocha malt finish. Nevertheless, rednecks and couch potatoes will like its casual splendor.